At the guarding border of the Moscow state.. Painting by Sergey Vasilievich Ivanov. The Crimean Tatar's invasions of Russia (Muscovy) began in 1507, after the death of Moscow's grand duke Ivan III, with the Crimean Khanate attacking the Russian towns of Belev and Kozelsk. Over the course of the 16th century, the outer border of the Wild Steppes was near the city of Ryazan, outside the Oka River. 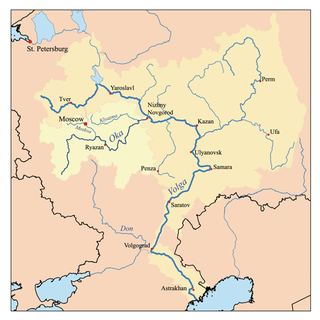 The main path for the invading forces to Moscow was the Muravsky Trail, running from the Crimean Isthmus of Perekop, between the basins of the Dnieper and Severskiy Donets rivers, and finally up to Tula. The Tatars would turn back only after extensive looting and kidnapping, the Tartars usually managed to penetrate 100–200 kilometers into Russian territory. Captives were subsequently sent to the Crimean city of Caffa to be sold into Slavery. As a result, the Russian population in the border regions suffered heavily. Each spring, Russia mobilized up to 65,000 soldiers for border service. The defensive lines consisted of a circuit of fortresses and cities. To protect from invasions by the Nogai Horde in the region between the Volga and Irtysh rivers, the Volga cities of Samara (1586), Tsaritsyn (1589), and Saratov (1590) were founded. The most damaging invasions occurred in 1517, 1521 (supported by the Khanate of Kazan), 1537 (supported by the Khanate of Kazan, the Lithuanians, and the Ottoman Empire), 1552, 1555, 1570–72 (supported by Sweden and the Ottoman Empire), 1589, 1593, 1640, 1666–67 (supported by Poland-Lithuania), 1671, and 1688. In 1570 the Crimean Tatars' horde devastated the Ryazan borderland of Muscovy encountering minimal resistance. In May 1571, the 120,000-strong Crimean and Turkish army (80,000 Tatars, 33,000 irregular Turks and 7,000 janissaries) led by the khan of Crimea Devlet I Giray, and Big and Small Nogai hordes and troops of Circassians, bypassed the Serpukhov defensive fortifications on the Oka River, crossed the Ugra River and rounded the flank of the 6,000-man Russian army. The sentry troops of Russians were crushed by the Crimeans. Not having forces to stop the invasion, the Russian army receded to Moscow. The rural Russian population also fled to the capital. The Crimean army devastated unprotected towns and villages around Moscow, and then set fire to suburbs of the capital. Due to a strong wind, the fire quickly expanded. The townspeople, chased by a fire and refugees, rushed to northern gate of capital. At the gate and in the narrow streets, there was a crush, people "went in three lines went on heads one of another, and top pressed those who were under them". The army, having mixed up with refugees, lost order, and general prince Belsky died in a fire. Within three hours, Moscow burnt out completely. In one more day, the Crimean army, sated with its pillage, left on the Ryazan road to the steppes. Contemporaries counted up to 80,000 victims of the invasion in 1571, with 150,000 Russian taken as captives. Papal ambassador Possevin testified of the devastation: he counted in 1580 no more than 30,000 inhabitants of Moscow, although in 1520 the Moscow population was about 100,000. After the burning of Moscow, Devlet Giray Khan, supported by the Ottoman Empire, invaded Russia again in 1572. A combined force of Tatars and Turks, however, this time they were repelled in the Battle of Molodi. In July–August, the 120,000-strong horde of Devlet I Giray of Crimea was also defeated by the Russian army, led by Prince Mikhail Vorotynsky and Prince Dmitriy Khvorostinin. Later, the Russian expansion turned to the Black Sea region and Crimean khanate was invaded several times in the 18th century and finally conquered during the Russo-Turkish Wars. This list does not include raids into Poland-Lithuania (75 raids during 1474–1569:17) A longer list can be found in ru:Крымско-ногайские набеги на Русь. c. 1533: Abatis defense line about 100 km south of the Oka. 1618: Nogais release 15,000 captives in peace treaty with Moscow. c. 1650: The Belgorod Line pushes Russian forts 300 km south of the Abatis Line. c. 1680: Izium Line: Russian forts were built within 150 kilometers of Black Sea. 1687, 1689: Crimean campaigns: attempt to invade Crimea fails. 1769: A winter raid into New Serbia. Several thousand were captured. 1774: Crimea became a Russian vassal. 1783: Crimea annexed by Russia. ^ Robert Payne and Nikita Romanoff, Ivan the Terrible, (Cooper Square Press, 2002), 329. ^ a b A Global Chronology of Conflict: From the Ancient World to the Modern Middle East, Vol.II, ed. Spencer C. Tucker, (ABC-CLIO, 2010), 531. ^ Robert Nisbet Bain, Slavonic Europe: Apolitical History of Poland and Russia from 1447 to 1796, (Cambridge University Press, 1908), 124. ^ Alan W. Fisher, The Crimean Tatars, (Hoover Press Publication, 1987), 45. ^ a b Robert Nisbet Bain, Slavonic Europe: Apolitical History of Poland and Russia from 1447 to 1796, 124. ^ a b c d e f g h i j k l m n o p q r s t Davies, Brian (2007). Warefare,State and Society on the Black Sea Steppe,1500-1700. ^ a b Stevens, Carol (2007). Russia's Wars of Emergence 1460-1730. ^ Sunderland, Willard (2004). Taming the Wild Field. Vasily Klyuchevsky, The Course of Russian History, Vol. 2. 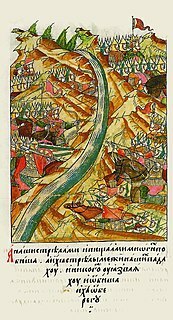 The Great Stand on the Ugra River was a standoff between the forces of Akhmat Khan of the Great Horde, and the Grand Prince Ivan III of Muscovy in 1480 on the banks of the Ugra River, which ended when the Tatars departed without conflict. It is seen in Russian historiography as the end of Tatar rule over Moscow. The Russo-Kazan Wars was a series of wars fought between the Khanate of Kazan and Muscovite Russia from 1438, until Kazan was finally captured by Ivan the Terrible and absorbed into Moskovia in 1552. Muravsky Trail or Murava Route was an important trade route and according to the Russian historiography a favourite invasion route of the Crimean Tatars during the Russo-Crimean Wars of the 16th and early 17th centuries. As described in the Book to the Great Chart of Muscovy (1627), the route went north from the Tatar fortress of Or Qapı (Perekop), the gateway of the Crimean peninsula, east of the Dnieper to the Russian fortress of Tula, 193 km south of Moscow. The Tatars of the Crimean Khanate and the Nogai Horde conducted slave raids in the East Slavic territories controlled by Russia and Lithuania. These raids began after Crimea became independent in about 1441 and lasted until the peninsula came under Russian control in 1774.